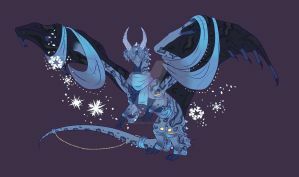 This is one of my dragons in Flight Rising; a game about having pretty dragons.. sigh. Flechte of the Unholy Three, manicuring his precious talons on some marble. He does have them on his front feet as well as on the back, unlike most wildclaws, so he’s quite proud of that. He makes sure to never use them in battle, so as to not break them. Instead, he swings his head like a mace, with surprising precision. Flechte might not be the brightest dragon of the Dreameaters, but he sure has the prettiest claws!